On a whim, Mathis, Peter and I decided to go to Bratislava this Saturday, since it’s only 60 kilometres away from Vienna and an extremely easy bus ride away. 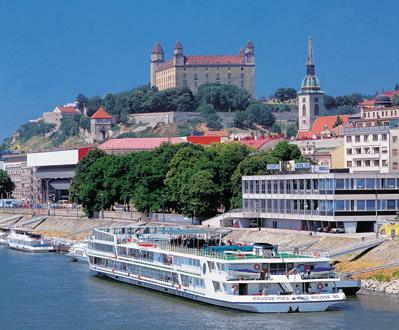 The bus goes between Wien and Bratislava 19 times a day, and is only 14 euros round trip — it would be wrong not to go. Mathis hadn’t been there in years, and it was Peter’s first time visiting as well as mine. I went there knowing absolutely nothing about Slovakia, except for the fact that its currency is euros and there’s a castle there (but I could have guessed that, it being a European city). We had just missed the 3 p.m. bus, so we caught the next one and got to the city by 5 p.m. I didn’t bring my camera, since I knew we’d only have a couple hours of sunlight on our brief adventure and didn’t want to be lugging it around for no reason all night. I’m definitely going back there when I’ll have a real chance to take photos, since the city centre has beautiful winding cobblestone streets and some great church spires. We decided to walk to the castle on the hill so we could look out onto the city in the crepuscular light. 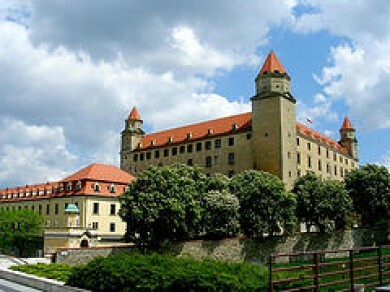 The main part of the castle was rebuilt in the 1950s after the older one burned down, so it’s in pretty good shape. It’s right by the river, and it was quiet up there, minus the muffled traffic from the bridge below and some kids starting their night off right by pre-drinking in a rather picturesque alcove in the castle wall. It was a little more dramatic at night. By the time we left the castle grounds, night had fully fallen and it was time to go out on the town. And thus began our epic bar crawl, which had actually begun somewhat earlier on the bus ride with some polish vodka and apple juice (both the definition and purpose of “Road Vodka” are similar to “Road Gin,” naturally). We got a beer at a bar nearby –- just one of the many bars of the night of which I don’t recall the name — and then stopped at at second bar for some dinner. We ventured into the town’s token Irish Pub (called, predictably enough, “Irish Pub”) to hear two pony-tailed men offering their adequate cover song renditions to the sizeable audience, and then went in search of some true Euro-trash techno to make the night truly complete. Lulled by the beats coming from a random alleyway, we found a bar that looked like it had potential to be the hoppin’ club we were seeking. It even had flashing lights and glass doors and everything! Alas, it was tiny and mostly empty, although to its credit it had free peanuts and a TV playing Michael Jackson music videos for most of the time we were there. So, not a complete bust! We stayed for one beer and asked our waitress where she thought we should go, and she directed us to a bar up the street. Primi was definitely more on the Euro-trashy end of the spectrum, but it was still a little classy for what we wanted and the drinks were accordingly pricy compared to the beer we’d been consuming up to this point. However, the DJ was decent, so we stayed for a while to dance and be amused by the locals — not that they were outlandishly dressed, for the most part. Best of all, some of the men were wearing shirts with several buttons undone, had their hair greased, and were wearing chains: sartorial perfection. When we left Primi at around 2 a.m., we looked around halfheartedly for an electronica event we’d decided we should go to, but I’d inconveniently left the address on a table a few bars back and we had no recollection of the names of the venue or the street. 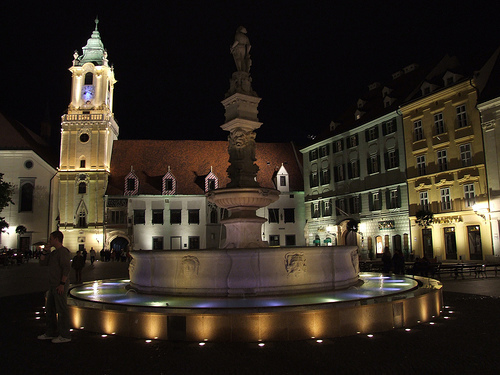 But a terrible memory is not a big deal when the night is still young(ish) and Bratislava is so walkable and charming. We randomly went into a bar called Rio so I could use the bathroom, and in the basement we found the Euro-trash beats we’d been searching for! The crowd was obnoxiously drunk and one guy broke my foot when he barged past me, but the DJs were awesome and we danced up a storm there for a long time. Exiting into the streets, we realized we’d lost an hour due to daylight savings time being this Sunday in Europe, so it was actually after 5 a.m. We made it back to the bus station and caught the next bus back to Vienna, on which I passed out immediately; I didn’t even wake up while we were parked at the Vienna Airport for 20 minutes. I was back at my apartment by 7:30 a.m., exhausted and kind of surprised that the trip had happened at all. I can never take for granted the fact that it’s so quick to travel between countries here and have an adventures – it’s awesome! We tried playing in this fountain but it had no water! Whirlwind tour, Bratislava! I’ll be seeing you soon. My next adventure is going to Budapest, Hungary with Mink to meet Dave this Friday!